In many ways, mental disorders like depression, schizophrenia, OCD and dementia can be more brutal and debilitating than any physical injury a person might get: after all, upon seeing a cast, one can handily deduce a broken bone…how possible is it for one to deduce a broken mind using the same process? Not only do many who suffer from mental illness suffer alone, many of the ill don’t even realize how “sick” they are until their conditions have spiraled wildly out of control: when you’re trapped within the fun-house of your own mind, after all, it’s difficult enough to make sense of the world on a moment-to-moment basis…trying to figure out your place in the larger, cosmic scheme can be nigh impossible, similar to building an entire jigsaw puzzle of identical, blue sky pieces. Legendary counter-culture animator Don Hertzfeldt’s extraordinary, immensely painful It’s Such a Beautiful Day (2012) examines the issue of mental illness from the inside, putting us into the shoes (and mind) of an ordinary, every-day sort of fellow named Bill. 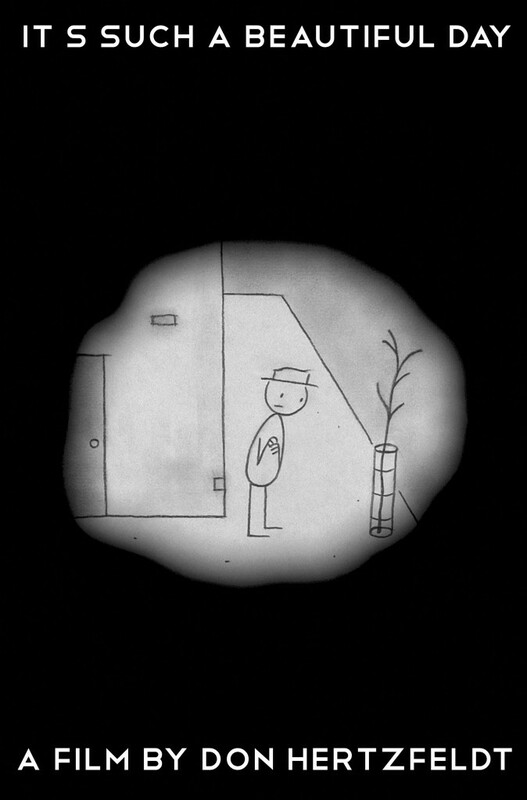 When we first meet Bill, his off-the-wall observations about the banality of life have the rhythm and flow of a genuinely hilarious stand-up comic, the incisiveness of his commentary belied by the off-handed simplicity of Hertzfeldt’s hand-drawn stick figure animation. As the film goes on, however, Bill’s observations gradually become stranger and more surreal, a tonal shift further accentuated by the increasingly bizarre and absurd visual images. As Bill begins to describe his very colorful family, we gradually get more of the corner pieces in this particular puzzle: the history of mental illness in his family is very explicit…as one character says, “Genetics is pretty messed up.” When put into context of the growing gulf in Bill’s mental faculties, much of what we’ve already seen comes into sharper focus. Just when we’ve gotten used to this sudden shift, this virtual pulling of the rug from beneath our feet, Hertzfeldt makes another hairpin turn and we’re suddenly knee-deep in some of the most beautiful, challenging discussions about the meaning of life and the nature of happiness to factor into any film, much less one animated with simple stick figures. By the time the film ends, not only do we emerge with a greater understanding of the enigma known as Bill but we walk out with a greater understanding of the human animal, as well. Bill is us and, under the right (or wrong) circumstances, any one of us can, and will be, Bill. At times, you’re confronted with films that pack such a hefty emotional punch that watching them often feels like going ten rounds with an iron-fisted juggernaut: Hertzfeldt’s It’s Such a Beautiful Day is one of those films. Stitched together from three previous shorts, with additional material to help it all cohere, the film is nothing short of stunning: even at just over an hour, in length, there’s nothing about the film that feels small or inconsequential. Indeed, the film becomes so raw and painful, after a point, that the animated style almost feels like a necessity: any more sense of realism, here, and the whole thing would be almost to intense to bear. It’s to Hertzfeldt’s immense credit, then, that It’s Such a Beautiful Day so expertly balances its hilarious moments with its heartrending ones: too much on either side and the film might risk becoming sappy or melodramatic. One of the more ingenious things that Hertzfeldt does here is to co-mingle his animation with brief flashes of the “real world,” a technique that begins gradually but builds to a truly dizzying climax that completely obliterates our preconceived notions of what, exactly, constitutes an animated film. While this isn’t the first film to freely blend live-action and animation (in a way, its closest relative might be the use of live-action in The Lego Movie (2014), although Hertzfeldt’s shorts easily predate that film by several years), the use of the technique is much more subtle and powerful here. In many ways, Hertzfeldt may have come up with the perfect visual depiction of a fractured mental state, one in which live-action, animation, repetitive voice-overs, unreliable narrators, splashes of color and sudden noises combine to keep us constantly on edge and at arm’s length from our troubled protagonist. In almost every way, It’s Such a Beautiful Day is a complete tour de force for Hertzfeldt: written, directed, narrated, produced and shot by the animator, his pitch-black sense of humor and inability to sugarcoat difficult subjects covers every frame of the film like an especially rich veneer. Were it not for the involvement of Brian Hamblin (known not only for his editing of the Hertzfeldt shorts that comprise It’s Such a Beautiful Day but for effects editing on huge productions like Spider Man 3 (2007), I Am Legend (2007) and Watchmen (2009), as well), It’s Such a Beautiful Day would be a virtual one-man show. As it is, there’s a singularity of vision, here, that marks the film as a complete, unified whole, the equivalent of carving a detailed wooden totem from a single block of oak. As someone who’s not only known plenty of folks with mental disorders but lived several decades with his own, it should come as no surprise that It’s Such a Beautiful Day hit me pretty hard: I’ll wager that would be the identical outcome for anyone in a similar situation. While Hertzfeldt’s film is not overwhelmingly dour or emotionally manipulative, there’s a brutal honesty and inherent melancholy to both the subject and film that’s difficult to shake. By turns hilarious (the segment involving a tenacious guy with a leaf-blower could have been lifted wholesale from my own experiences), terrifying (the segment involving Bill’s highly disturbed grandmother and her “cat therapy” is truly the stuff of nightmares) and almost overwhelmingly sad (the segment where Bill begins to lose memories of his loved ones is incredibly difficult to watch), It’s Such a Beautiful Day really puts you through the wringer, albeit in the best way possible. Ultimately, despite its grim subject matter and overriding feeling of helplessness, Hertzfeldt’s multiple-award-nominated film is not the alpha and the omega of sad cinema: in truth, there’s an underlying air of optimism and hope in the film’s message, much of which comes during the penultimate scenes where Bill is “transitioning” from this reality to the next. At this point, Bill comes to the life-affirming notion that the world is constantly filled with wonder and beauty, most of which we glance over en route to whatever our ultimate “goal” is. We can try to soak it all in at the end, ingesting as much beauty and life as we can in huge, shuddering breaths, like one drowning and trying, desperately, to fill sodden lungs with necessary air. That’s one way to live life, no two ways about it, and many people do just that. On the other hand, as Hertzfeldt so cannily notes, there’s a lot to be said for trying to get the most out of the ride, soaking up and absorbing as much beauty, tragedy, wonder and horror as you can, well before you start that final, terrifying plunge into the unknown. For the millions of people, worldwide, who deal with mental illness on a daily basis, it can be all but impossible to see the light at the end of the tunnel. Hertzfeldt, through his unforgettable art, reminds us, one and all, that there’s always hope. As Bill calmly echoes, at the very end: “It’s such a beautiful day.” It is. Or, at least, it can be, provided you’re able to open your heart and your eyes to the possibilities. Life will never be easy, or fair, or logical: it can be beautiful, however, and that’s probably all that any of us can reasonably expect.